David Hill’s interest in beef eating quality and cattle processing performance has led him to taking on several industry roles in recent years, including Beef Australia national carcase competition chair, Cattle Council of Australia independent director, and Australian beef industry systems and food safety committee chair. Last October, the Central Queensland cattleman rather reluctantly added one more to his CV: Television advertising star. 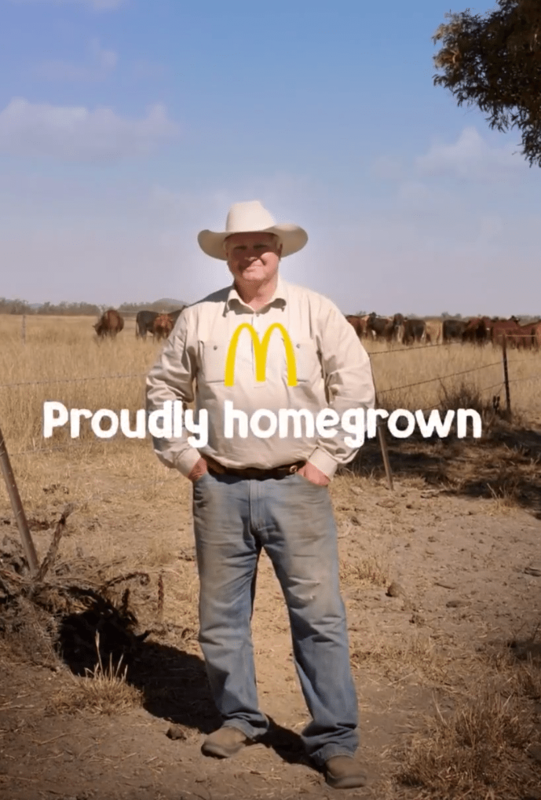 Over the summer months David and his family have appeared in television, print, online and social media advertisements promoting McDonald’s homegrown food supply. For a while there Australian Meat Industry Council CEO Patrick Hutchinson couldn’t leave his Melbourne office without seeing David’s face staring back at him from a billboard. “My mug is bad enough in a mirror without having to see it on a billboard,” David empathised with the processing industry chief when Mr Hutchinson told him about his new view last year. Mr Hill’s association with McDonald’s began a few years ago when the burger chain began discussing with Australian cattle industry leaders its intention to lead an industry-wide movement on beef sustainability. Some in the grassfed industry expressed fear at the time that such moves by McDonald’s and other global beef customers could ultimately force Australian cattle producers to have to adopt prescriptive production rules and monitoring and reporting requirements. David Hill does not share this view. “It is better to be on the bus than under it,” he said. “There wouldn’t be a bigger customer of Australian beef globally than McDonald’s. They are there to promote beef, it is still their number one burger item. “They want to expand their business in countries like China which will mean selling more beef. One of the McDonald’s ‘homegrown’ advertisements featuring mustering scenes from the Hill family’s Clarkewood property at Clarke Creek. When approached to appear in a McDonald’s advertising campaign last year, Mr Hill knew he’d cop plenty. Why would someone so keen on beef eating quality be associated with a fast food chain? But he did it because he supports beef eating quality. “I am only doing it because I believe in McDonald’s integrity,” he said. “They reckon if a processing plant can pass a McDonald’s audit, it will pass any audit. “About 15 percent of even the best carcases goes into trim. “And a big thing for me was when we talked to McDonald’s about sustainability they talked about the three ‘E’s – environment, ethical but also economic. “They want to expand their business and if they are going to do that, they will need more beef. “There is no more land, if they want beef producers to be more productive, they know it will take a level of investment. They understand that if we are going to be investing in our businesses we need to have the confidence to do it, and a price and return at farm gate that is going to allow us to do that. 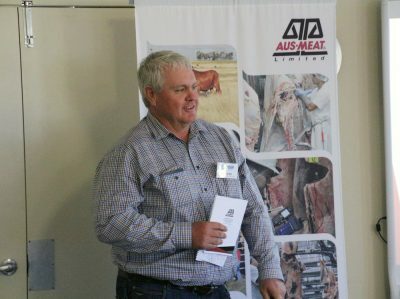 David Hill addressing a producer information day in his role as Cattle Council of Australia independent director last year. With his wife Elizabeth, Mr Hill runs his family’s 8500-hectare EU-accredited cattle breeding and growing property at Clarke Creek in Central Queensland. What the operation lacks in scale the family aims to make up for with the production of high eating quality beef and capturing premium returns. The Hills strive to achieve an MSA compliance rate well above the national average. They follow meat processor price grids closely and make production decisions accordingly. From producing steers a few years ago that averaged well over 350kg carcase weight – “which aren’t really suited to the market any more,” David says – the operation now turns off steers averaging 300-320kg. “We’ve been driven by the market, and the market wants a more moderate animal with better eating quality,” he said. Of 220 steers sent to Borthwicks in one consignment, 218 graded EU. Angus and Belmont Red bulls are joined to a Charolais/Santa cross breeding base, with the operation geared to turning off about 300 finished cattle a year. However production is back on recent years after run of dry seasons was followed up by a devastating flood in the wake of Cyclone Debbie in March last year, from which the Hills are still working to recover. They still don’t know exactly how much rain fell in the deluge because the surging floodwaters washed away their houseyard fence which held their rain gauge. The floods also demolished sheds and cattle yards, and 30 kilometres of fencing. One and a half metres of surging floodwaters washed through, and destroyed, their home. Some of the family’s beloved horses were also lost in the floods, but fortunately all other animals on the property survived. Mr Hill said the floodwaters hit so suddenly and with such powerful devastation it was a miracle no family members were harmed. The physical damage bill exceeded $700,000. The emotional cost can’t be so easily counted. Close to a year later they are still in the process of rebuilding, this time on higher ground. Construction work on a new house was finally set to begin last week. “The country stood up pretty up well. We try to keep a level of grass, so we didn’t have any erosion,” Mr Hill said. “It is what it is… the country has recovered a hell of a lot better than we have. He also feels for those in the west who are barely hanging on after five or six failed summers in succession. “The processors say the cockies should be happy, they are getting twice as much money as what they used to. “But you’ve got to remember, if you’ve only got half as many cattle as you used to have it doesn’t put you in any better position. “Worse than that, some people don’t have any. I have real concerns for those people and whether they will ever get back in the industry. Congratulations on a great article that showcases the often unnoticed and unappreciated work that a large number of producers do to support and promote the Australian red meat industry. Having known David for nearly 10 years, I am fully aware of the many hours that he passionately puts into driving positive outcomes for the beef industry often at the expense of time that he could have spend on his own property or with his family. I also know that there are many others like David in both the sheep and beef industries that are doing exactly the same. . In a leadership course many years ago, we were told that change is one of the most confronting elements for many people and that the most profound decisions that have been made in history are not popular and never easy. I am grateful that we have people like David that are prepared to make the hard and unpopular decisions as they will be the most important ones for the Australian red meat industry. More stories like this should be used to promote and inspire the industry to change.